This paper in PNAS by William A. Beltran, Artur V. Cideciyan, Alfred S. Lewin, Simone Iwabe, Hemant Khanna, Alexander Sumaroka, Vince A. Chiodo, Diego S. Fajardo, Alejandro J. Román, Wen-Tao Deng, Malgorzata Swider, Tomas S. Alemán, Sanford L. Boye, Sem Genini, Anand Swaroop, William W. Hauswirth, Samuel G. Jacobson and Gustavo D. Aguirre is a continuation of their work in retinal degeneration, this form of retinal degeneration, X-linked retinitis pigmentosa (RP). X-linked RP is a subtype of RP that is inherited in a different manner than RPs inherited in autosomal dominant or autosomal recessive manners. While rare, X-linked RP can be recessive, affecting only males or dominant, affecting male and female offspring. 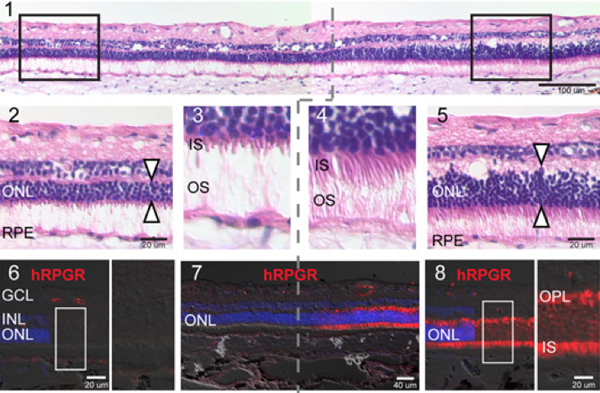 While these authors past work has been in gene therapies in mouse and dog models where the defect was in the retinal pigment epithelium, this study presents data from a defect in photoreceptors, specifically mutations in the RPGR gene that encodes a photoreceptor ciliary protein. I’ll look forward to hearing more about this work at the upcoming pre-ARVO, ciliopathy meeting.